Okay, so here I am back with this God concept again. 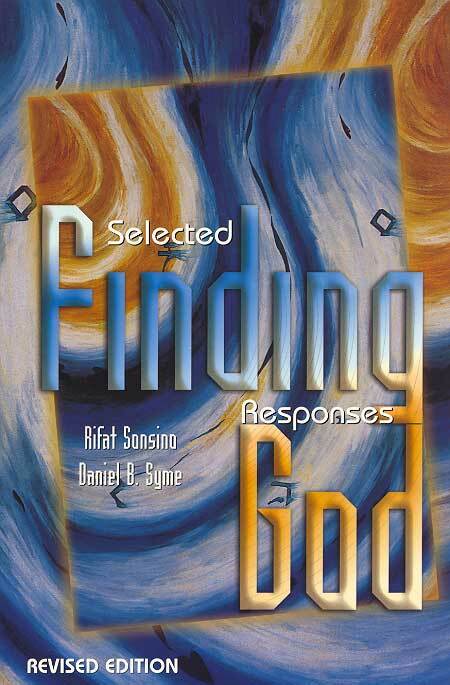 One of the books my rabbi suggested I read was called Finding God: Selected Responses, by two Reform rabbis, Rifat Sonsino and Daniel B. Syme. The book is a simple – VERY simple, embarrassingly simple, like 8th-grade-level simple – summary of how different Jewish thinkers approach God. It starts with concepts of God in the Bible and rabbinic literature, and goes on to figures such as Maimonides, Isaac Luria, Spinoza, Martin Buber, Mordecai Kaplan, Erich Fromm, and Abraham Heschl. And they spend only the first 33 out of about 170 pages on this classical theist/puppeteer concept of God. That’s not even one-quarter of the book. “Most Jews tend not to talk about God. Accordingly, the great majority of Jews receive the implicit message that ‘the’ Jewish God idea is the theology known as ‘theism.’ The fact is, there is more, much more…. “Though classical theism may be the most common Jewish theological position, it is by no means the only one possible. Atheism, therefore, is frequently not a rejection of God but rather a rejection of classical theism. A self-styled nonbeliever may be surprised to learn that he or she is really a Jewish religious naturalist, a Jewish humanist, a Jewish pantheist, or other. I like this! I like that they’re trying to create a big tent for all kinds of Jewish believers, non-believers and sort-of-believers. And I found myself nodding in recognition as they described the ideas of certain modern Jewish thinkers. Or take Erich Fromm, a radical humanist psychologist whose writings inspired me as a teenager. Although he spun his own interpretation of Judaism in a book called You Shall Be As Gods, he wasn’t a rabbi or any kind of muckety-muck within organized Judaism. I don’t know if he even belonged to a synagogue. So I was surprised and excited to see that they considered him part of a canon of Jewish thinkers. Non-theistic mysticism! That doesn’t sound too far from my own leanings. So this all makes me want to go a little deeper and read (or re-read) folks like Kaplan and Fromm in their own words. Can they really say that all these more modern God concepts are as authentically Jewish as the old puppeteer God? Take Spinoza as an extreme example. Sure, he was Jewish. But he was excommunicated! Doesn’t it seem a bit of a reach to include someone who was excommunicated as part of the Jewish canon? And that leads to the bigger question of who determines what is authentically Jewish. Orthodox rabbis would probably deny legitimacy to most of the modern thinkers in the book. Fromm and Kaplan would have no place in their canon. So who defines Judaism – the Orthodox establishment, the Conservative and Reform movements, or …. (you fill in the blank) ??? Shifting gears quite abruptly, happy holidays! A belated chag sameach to my Jewish friends, and hopes that the smell of cooking oil has started to fade from your kitchen. Happy winter solstice to everyone. But not this year. Sam and I are going to Kung Pao Kosher Comedy — a two-decade-old San Francisco Christmas tradition of a Chinese banquet with Jewish stand-up comics. Intrigued? You may still be able to buy tickets here. This entry was posted on December 21, 2009 at 10:21 pm and is filed under Belief (or not) in God, Judaism. You can follow any responses to this entry through the RSS 2.0 feed. You can leave a response, or trackback from your own site. This posting is really wonderful, thanks. I am particularly struck by the idea that people see a “magnified demon” when they think of God, and believe that is very true and why so many people are so put off by the idea of a religion or religious experience. And who can blame them with what they see on the religious landscape? I need to ponder this awhile. Thanks again for the post. Well done. The ‘big tent’ point is central to the vibrancy of Judaism throughout the troubles Jews have witnessed throughout the centuries. For example, last week our book group discussed Art Spiegelman’s graphic novel Maus. It portrays Jews in Europe and Nazi death camps as mice confronted with unbridled feline evil, and the relations in the modern family of a survivor. Someone in our bookgroup wondered how any Jew could maintain faith when their G-d so clearly couldn’t be watching over them. Classical theism strikes again. I responded that such a G-d isn’t how many Jews feel their faith, and that perhaps this explains why the Holocaust was a crisis in faith only for some Jews. For many survivors and other Jews (as with many people of many other faiths), though, the Holocaust never affects faith; the ‘G-d connection’ for these people is quite different from the notion of a G-d watching over us. I’m very happy to read this — so many of my Jewish friends don’t seem open even to any kind of spirituality, let alone a deity, and that seems to me to be such a loss. I’ve often envied the cultural connection Jews seem to share, but have also felt like something was missing. The resources you’ve mentioned will be the start of some good exploration for me as well….